At SecuriWORLD Security Services, we genuinely care about making a positive impact within the communities we serve. This passion is what inspired us at SecuriWORLD to enter into the Security Services sector and make it our personal mission to protect the people and land of British Columbia. SecuriWORLD identified a gap in the Security Services industry. 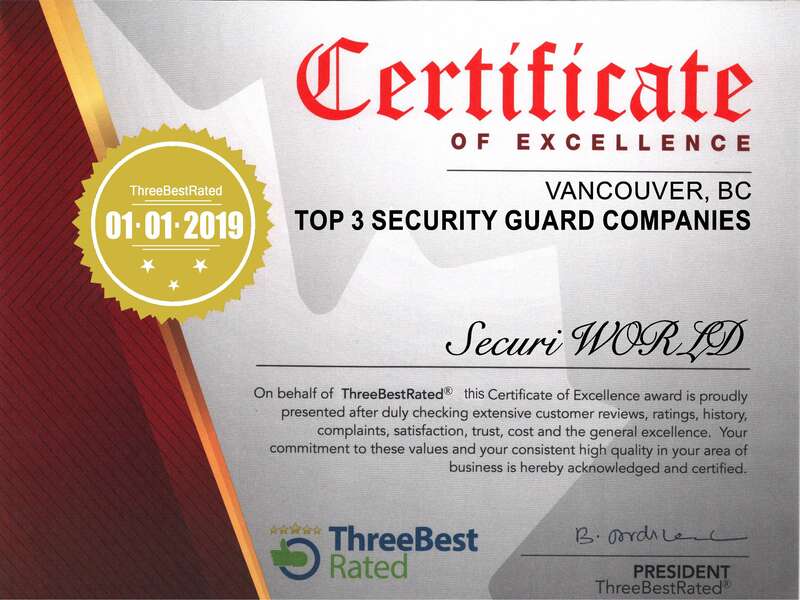 There was a severe shortage of Security Guard companies in the Lower Mainland who were willing to take social responsibility for the treatment of their staff and the communities which they serve. Since its inception SecuriWORLD has made a firm commitment to not only provide high quality Security Guard, Event Security, Concierge, Mobile Security, and other Specialized Security Services at competitive rates, but to do so in a way that directly benefits our staff and the beloved neighbourhoods we share. SecuriWORLD is a Security Guard company that recognizes the unique value that each individual brings to the workforce. That is why being an Equal Opportunity Employer is very important to us. We have partnered directly with Canadian based non-profit organizations such as WorkBC, Partners for Workplace Inclusion Program, and the Aboriginal Friendship Centres of British Columbia in order to give equal opportunity to underrepresented groups and assist in the rehabilitation of individuals re-entering the workforce. SecuriWORLD is a firm believer in Human Rights and believes that every individual, regardless of background or circumstance, deserves the right to take an active role in protecting their community through a rewarding career as a Security Guard or other Security Services Personnel. Furthermore, we practice Promotion From Within and ensure that our Security staff are not just getting a job, they are embarking on a career development journey that will launch many Security Guards to Security management positions. SecuriWORLD Security places a high value on community involvement and we understand the importance of giving back to the neighbourhoods in which we operate. The Security Guards and other Security Personnel from SecuriWORLD routinely organize volunteer team building exercises to pick up garbage and remove hazards from our local streets of Vancouver. SecuriWORLD Security staff has also taken the initiative to regularly provide meals and other life essentials to the homeless and mentally ill persons of Vancouver. We consider it our duty to be a Security Company that often donates our Security Guard Services, Access Control, and Event Security Staff free of charge to charitable events and fundraisers in British Columbia as our way of giving back to the community. SecuriWORLD is considered to be a stepping stone for individuals transitioning from the station of a Security Guard to that of a Police Officer or other Law Enforcement position. Numerous Security staff have been welcomed to the team who ultimately aspire to join the RCMP or their local Police Department. We are proud to provide these admirable Security Guards with practical work experience, positive references, and a network of continued support which equips and prepares them for a life-long career in the Public Safety sector. SecuriWORLD is a Security company that regularly takes time to schedule office tours for children who are passionate about law enforcement and want to learn more about becoming a Security Guard. When we work together to support young, enthusiastic individuals to learn more about the Security industry, we create a safe environment for generations to come. SecuriWORLD Security has an open door policy and wants to hear from you. If you or anyone you know has an idea for how SecuriWORLD Security can increase our social responsibility or better serve our community, please feel free to contact us at 604-282-3437 or info@securiworld.ca. We would love to get involved.